Onigiri (Japanese Rice Balls) - Easy and delicious Japanese rice balls shaped in triangles and wrapped with seaweeds. Topped with fish roes. So good! It’s back to school season and I have been trying out new lunch box recipes for little G.
He loves Japanese food so I have started making onigiri or Japanese rice balls for him. It’s an easy and healthy lunch to bring to school and the little ones love them. If you are not familiar with onigiri, they are basically balls of rice shaped in triangles, wrapped with “nori” or seaweed, with or without filling. Traditionally, it could be filled with grilled salmon, salted cod roe, tuna mayonnaise, Japanese pickled plum, etc. Anyway, for my onigiri recipe, I made it per little G’s liking so it’s not the most authentic version. He loves his sushi rice seasoned with rice vinegar just like sushi, so I did add some rice vinegar. Traditionally, you don’t need rice vinegar. 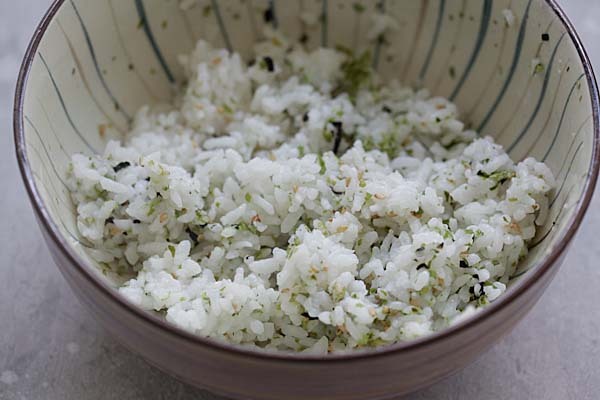 I also added Furikake (bottled Japanese seasonings) to add flavors to the rice. He also likes fish roes so I added some on the rice balls. If you are looking for new back-to-school lunch box idea, try my onigiri Japanese rice balls recipe! 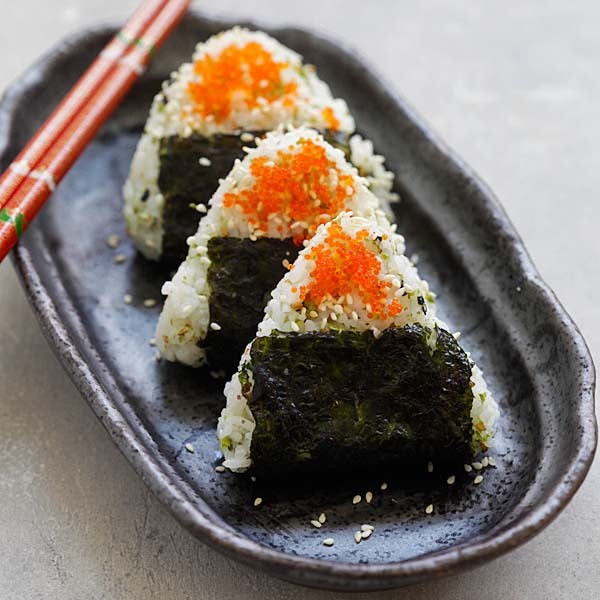 Onigiri - Easy and delicious Japanese rice balls shaped in triangles and wrapped with seaweeds. Topped with fish roes. So good. Cook the rice using a rice cooker. Let cool. Add the rice vinegar (if using), Furikake, salt and white sesame to the rice. Stir to mix well. Using a triangle Onigiri mold or your hand, shape the rice into six (6) triangle rice balls. Wrap the bottom part of the rice balls with the seaweed. Top with the Tobiko. Serve immediately. All photos and recipes on Rasa Malaysia are copyright protected. Please do not use the photos and recipes without prior written permission. If you wish to republish this recipe, please rewrite the recipe in your own words instead of copy and paste and link back to //rasamalaysia.com/onigiri-japanese-rice-balls/. Thank you very much! This looks delicious and sounds awesome to make. Have you made the ones that are stuffed before? I’m going to have to make this. Looks great! Round rice balls are made for a funeral or mourning period, other times are triangle shape. Also the seaweed sprinkle is furikake. Can’t remember when I first had these..
Hmmm… 5 years old ? We weren’t affluent so they were unadorned except for a pickled-plum (Ume-boshi) in the middle and wrapped completely with “nori”. I still enjoy them today.. many, many, many years later. Great recipe. I actually really appreciate this amazing recipe. I will make it for my family. Thanks!